If you think bigger is better when it comes to storage space, you might be interested in Western Digital’s My Book Studio Edition II, which combines two 3TB drives in a RAID 0 setup for a whopping 6TB of data storage. Aside from the My Book’s abundant space, the drive boasts quiet operation and read speeds that were comparable with other setups of its kind. Macworld Lab’s testing showed the drive to have read speeds that were very close to the competition. In our USB 2.0 testing, the My Book Studio Edition II posted scores of 36.4MBps in our 2GB folder read test, 36.9MBps in our 2GB file read test, and 36.7MBps in the AJA system test—all three scores just within 1 or 2MBps of other external desktop hard drives. Through FireWire 800, the My Book Studio Edition II posted 2GB folder read speeds of 76.2MBps, just 0.7MBps shy of matching the Iomega eGo Desktop ( ) and the CalDigit AV Drive 1TB ( ). The My Book Studio Edition II posted 2GB file read speeds of 85.6MBps, just behind the AV Drive 1TB and ahead of the eGo Desktop. The My Book Studio Edition II’s write speeds, though, weren’t quite as competitive. It achieved 28.2MBps in our 2GB folder write test and 28.9MBps in the 2GB file write test via USB 2.0. When tested over FireWire 800, the drive wrote the 2GB folder and file tests at speeds of 50.7MBps and 60.9MBps, respectively, all those scores being close to the bottom for external desktop hard drives. The My Book Studio Edition II, though, is well designed and easy to use. Like other drives in WD’s line, the array has a clean, streamlined look, with a gray plastic casing and perforated top. On the front, you’ll find an oval line that glows white light during activity, and the back has two FireWire 800 ports, separate eSATA and USB 2.0 ports, power input, and a power button. The My Book Studio Edition II weighs 4.5 pounds, not necessarily portable, but much lighter than other drives of its kind. WD includes FireWire 800, USB 2.0, and FireWire 800 to FireWire 400 cables. There’s also a power adapter with power plugs for use in the U.S., Canada, and the U.K., and a CD with software utilities and manual. Inside the case are two WD Caviar Green 3TB drives with 64MB of cache. The drives include WD’ IntelliSpeed technology, which ramps up or slows down the drive’s rotational speed depending on operation. The enclosure is fanless, and during regular use the My Book Studio Edition II was absolutely quiet, except for a slight click every so often, and just warm to the touch, never hot. You don’t need to install any software on your Mac to begin using the My Book Studio Edition II, but a software CD is included. On it you’ll find WD’s Anywhere Backup software, in case you don’t want to use Time Machine. Also on the CD is Drive Manager, a utility that allows you to change the configuration of the array. Once installed, Drive Manager sits in the menu bar of your Mac, monitoring the My Book Studio Edition II. We found the software simple to use, and we could change the alignment of our drives from RAID 0 to RAID 1, and even change the file system from HFS+ to FAT32, allowing you to share the drive with a Windows machine. The software also lets you know the health of both your array and the hard drives inside, even the temperature they’re running at. The only drawbacks to the software were that, in our use, it took a minute to change between settings, a bit slower than other arrays we’ve used, and the Drive Manager software adds another process running in the OS X background, something we prefer to avoid. Finally, the CD contains WD’s Turbo + drivers that are supposed to provide a performance boost, but we didn’t notice any performance difference. Though its write performance is less than stellar, the My Book Studio Edition II provides copious amounts of storage space, a sleek look, and plenty of connection options. 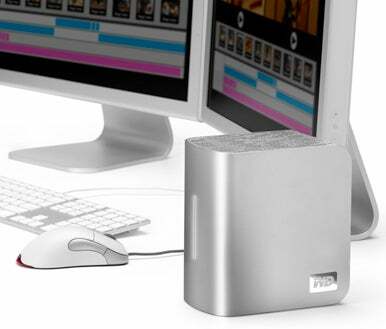 Western Digital also includes a limited 5-year warranty. If you need to store 722 hours of HD video or 1.5 million MP3s, this is a good storage device for your needs.